new tail designlast month at Chicago’s O’Hare airport. new design over a return to an old AA logo. 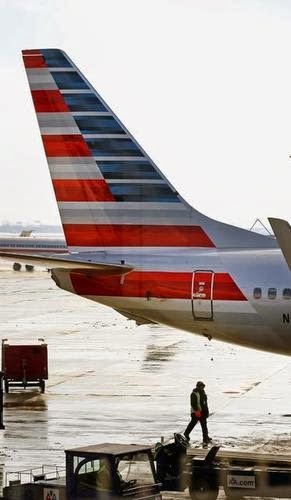 (Associated Press) DALLAS American Airlines says more than 60,000 employees voted, and a majority want to paint red, white and blue horizontal stripes on the tails of all AA planes. The company plans to repaint more than 1,100 American, US Airways and US Airways Express planes. New jets ordered by American already bear the election-winning look. It’s unlikely that any passengers pick an airline based on the paint job, but airline employees and aviation geeks can spend hours debating the subject. American introduced a new logo and began a fleetwide repainting of its planes a year ago. The carbon-composite bodies on many new jets made it impractical to keep the polished-metal look that American had sported since the 1960s. The new livery, as a plane’s appearance is called, drew mixed reviews, with some of the snarkiest comments aimed at the new tail. Doug Parker, who became CEO of American Airlines Group last month after American merged with US Airways, said that it would be too costly to start painting over the bodies of freshly painted planes, but he let employees pick the look of the tail. They were given two choices. American said 52 percent picked the new design, which looks like a nod to the United States flag. The other option was a return to the old logo – the letters “AA” below an eagle silhouette. Voting about the tail is one of several symbolic moves Parker has made to reach out to employees, who often clashed with American’s previous management. Among other things, he removed the parking spots that had been reserved for executives at the airline’s Fort Worth headquarters. “We of course can’t vote on every decision at the airline, but we do want input from all of you on issues that are important to your work lives,” Parker said in a message to employees on Thursday. Much harder work looms ahead for Parker, including combining the computer systems and workforces of American and US Airways. Charlotte Douglas International Airport will be the combined airline’s second-largest hub, after Dallas/Fort Worth.